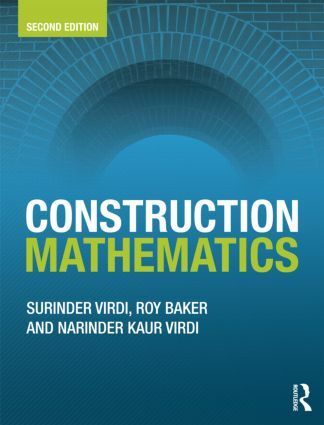 Construction Mathematics is an introductory level mathematics text, written specifically for students of construction and related disciplines. Learn by tackling exercises based on real-life construction maths. Examples include: costing calculations, labour costs, cost of materials and setting out of building components. Suitable for beginners and easy to follow throughout. Learn the essential basic theory along with the practical necessities. The second edition of this popular textbook is fully updated to match new curricula, and expanded to include even more learning exercises. End of chapter exercises cover a range of theoretical as well as practical problems commonly found in construction practice, and three detailed assignments based on practical tasks give students the opportunity to apply all the knowledge they have gained. Construction Mathematics addresses all the mathematical requirements of Level 2 construction NVQs from City & Guilds/CITB and Edexcel courses, including the BTEC First Diploma in Construction. Additional coverage of the core unit Mathematics in Construction and the Built Environment from BTEC National Construction, Civil Engineering and Building Services courses makes this an essential revision aid for students who do not have Level 2 mathematics experience before commencing their BTEC National studies. This is also the ideal primer for any reader who wishes to refresh their mathematics knowledge before going into a construction HNC or BSc.